Today I had a dinner in this restaurant. It was a night of Serbian football derby and they were forbidden to serve alcoholic drinks because the restaurant is near to the football stadium. Despite that we decided to stay, drinking sparkling water. The food was excellent, especially pork ribs, so we didn't miss a beer to much. We ordered a second bottle of water, but waiter said that they are out of it (can you imagine that is it possible that popular restaurant runs out of mineral water!). Waiter suggested that we take soda water instead and he brought a bottle of home made soda water. It was completely out of gas, and as we complained, he started to argue with us. He was very persistent and unpolite and he didn't want to bring us another bottle in return. My guests were unpleasantly surprised as he ruined a very pleasant evening with very good meal. We left in a hurry. Nice little place, nothing fancy about interior or menu just honest food. Generous portions, if you are not starved, you can easy share a portion.They have regulars young families with kids and its better to make a reservation because Kuhinja can be full. My favorite is Medaljoni sa pecurkama (Beef medallions with mushrooms) and they never fail. Most of the time I am in Belgrade I eat here.The food is great,the prices are maybe more expensive(or not) but the portion is also bigger than in other restaurants.menu is very deverse,so no matter what mood I am in they have on the menu.ambience is good,specially when the weather is nice,when the terrace is open(considering being close to the noisy street.staff are good some of them worked there as long as I can remember,the only problem is sometimes do to too many guest they are not very responsive but is tolerable.I am in Belgrade for the weekend this will be my lunch place as always. I have been to this place few times and it just got worse every time. 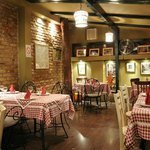 The service has always been slow but now, waiters are rude and really don't care about customers (a shame when you know that most of place in Belgrade have great service). They forgot to serve us a side dish and required us to pay for it, arguing that we should have reminded him to bring it. Regarding the food, quality was way poorer than an average (and cheaper) restaurant. Lot of tasteless sauce, salad not fresh, ..
And, as if it wasn't enough, a friend got food poisonned..
Been to Kuhinja Kitchen? Share your experiences!